“We’re not stupid people,” nuclear commander Gen. John Hyten said at a forum Saturday. 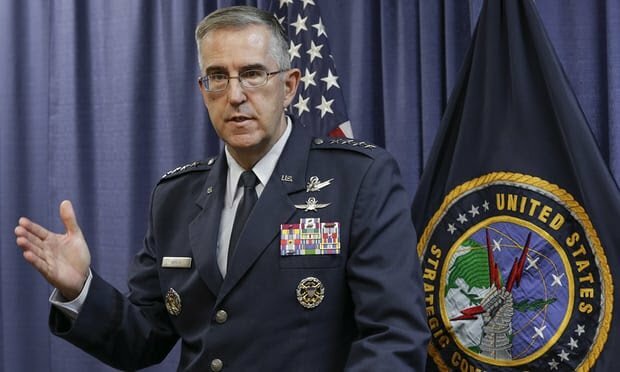 Hyten, the commander of the U.S. Strategic Command who oversees America’s nuclear arsenal, spoke at a forum titled “Nukes: The Fire and the Fury,” as recorded in a video on the event’s Facebook page. He didn’t define what exactly would constitute an illegal launch order. But Hyten said he has been trained for the past 36 years in the law of armed conflict, and mentioned the consideration of such elements as proportional response and unnecessary suffering that would be caused by such a conflagration. In the event Trump suggests an illegal strike, Hyten described a scenario in which he would present Trump with legal choices. In congressional testimony earlier this month, retired Gen. Robert Kehler, who served as the head of Strategic Command from 2011 to 2013, also said that the military is only obligated to follow legal orders. Hyten’s comments, first reported by CBS News, come in the wake of taunting threats against North Korea by the president. In August, Trump told reporters that if North Korea continued to threaten the U.S., its actions would be met “with fire and fury the likes of which this world has never seen before.” Many interpreted this to mean a nuclear strike. Trump also threatened in a United Nations speech to “totally destroy” the country of 26 million people if its leader, Kim Jong Un, threatened the U.S.
“This is a very serious subject and the world is a very dangerous place right now,” Hyten said Saturday. The forum Saturday included a video that showed scenes of nuclear devastation beneath the song “We’ll Meet Again” ― the same music used at the end of Stanley Kubrick’s 1964 antiwar film “Dr. Strangelove,” which famously ends with a nuclear holocaust. Hyten said he has seen the movie nearly half a dozen times.